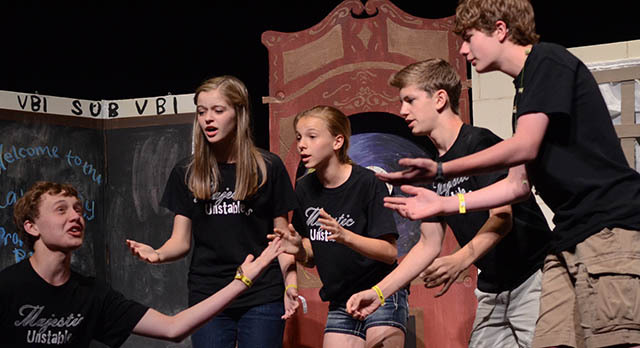 Destination Imagination teaches the creative process from imagination to innovation using “inquiry—guided group learning.” Students use inquiry to find solutions for their selected challenge. Team managers provide the guidance and tools needed to facilitate the students’ inquiry process. By working in teams of 2 to 7 members, students experience the advantages of teamwork. Team members learn to respect and build on the strengths and ideas of all team members. The Destination Imagination process includes 21st Century Skills, brain health, teamwork, STEM, leadership skills, and arts appreciation & skills. Recognize: becoming aware of a challenge or opportunity; maintaining a health state of mind (alertness and attitude). Imagine: applying critical and divergent thinking skills to develop ideas for solutions. Initiate and collaborate: taking risks and controlling behavior along with working in a collaborative manner. Assess: sometimes requires starting over or admitting failure and then starting the process all over searching for a new solution. Do you think you might want to start a team?